The enacted budget is $195 million higher than the budget proposed by the Governor. Lawmakers had an additional $60 million to work with as a result of greater revenue projections identified by the May Revenue Estimating Conference. The budget includes a number of positive investments for low and modest income Rhode Islanders. These include an increase in rates paid to child care providers and for providers of home-based services for seniors and people with disabilities. The budget appropriates additional funds for community-based providers serving families involved with DCYF and for community-based programs that support adults with intellectual and developmental disabilities. New funds are allocated to expand pre-K programs, for workforce development for adults, and for the second year of the RI Promise Scholarship Program. The proposal to impose co-payments on Medicaid recipients is not in the enacted budget while the proposal to redesign health services delivery for around 11,000 seniors and people with disabilities who have both Medicaid and Medicare coverage will move forward. The budget does not include any broad based tax increases. The sales and use tax is expanded to cover two new services – software as a service (SaaS) and security services. A number of fees are increased, including raising the cost for a duplicate or updated motor vehicle license from $5 to $25. Substantial new revenue is expected from the lottery, most of which is from implementation of sports betting. A number of economic development tax incentives are continued with the General Assembly providing additional oversight. 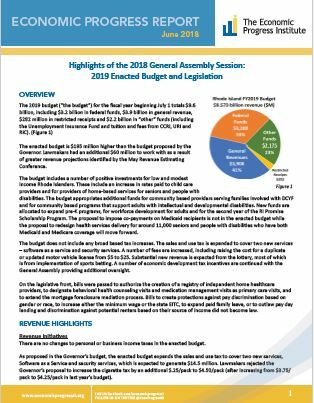 On the legislative front, bills were passed to authorize the creation of a registry of independent home healthcare providers, to designate behavioral health counseling visits and medication management visits as primary care visits, and to extend the mortgage foreclosure mediation process. Bills to create protections against pay discrimination based on gender or race, to increase the minimum wage and the state EITC, to expand paid family leave, to outlaw payday lending and to end discrimination against potential renters based on their source of income did not become law.